What are the specs for the below switch? I just bought a Razor EcoSmart and am already tired of leaning over to switch it on and off. Is this rated for 36v and/or 16a+? I'd love to put something like this on the handlebars. Handlebar mounted on/off switch for electric scooters and bikes. Maintained push button switch for main power or headlights. 65" long cable with 2 wires and 2.8mm male terminals for white wire connectors. Fits standard 7/8" (22mm) electric scooter and bicycle handlebars. Our handlebar switch item # SWT-23 is only rated for 1 Amp so unfortunately, it would not work as the power switch for the Razor EcoSmart. The Razor EcoSmart's power switch has two 16 Amp contacts which are bridged together by the scooter's wiring harness effectively making it a 32 Amp switch which is the size needed for the EcoSmart scooter. For a solution, the SWT-23 switch could be used in conjunction with the RLY-3640 power relay so the switch is used to turn on the relay's 5 Watt coil and the relay's 40 Amp contacts carry the load between the battery pack and controller. Wiring the switch and relay together is an uncomplicated task with only a few wires involved. Please see the attached Bosch-Relay-Wiring file to view a wiring diagram showing how to wire the switch and relay together. I'm going to wait until our Razor warranties expire to do this, but want to have a box with everything I need all ready to go when it does. Installing the relay and switch would be a custom wiring job so there are many different ways to go about it. 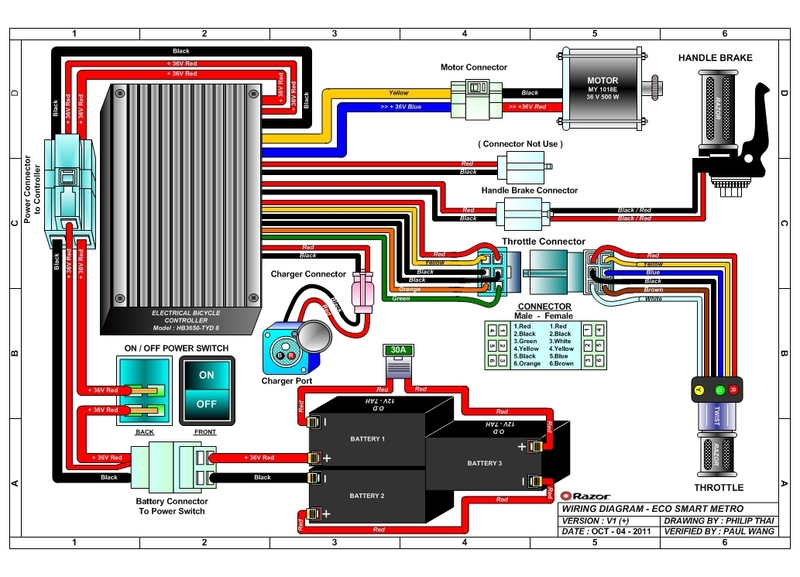 Looking at the EcoSmart's wiring diagram I can see that the positive and negative wires for the relay's coil will need to be spliced from the wiring harness or soldered onto the existing wiring harness terminals at the battery side of the harness. Here is a list of parts that I would grab off the shelf before starting the installation.